Washington used a third-quarter surge to open up what had been a tight contest and went on to a 69-54 victory over Montana on Saturday afternoon in the opening game of the Husky Classic in Seattle. The Lady Griz (4-4) were within five points, 36-31, midway through the third quarter and had a breakaway layup and a 3-pointer that could have made it a one-possession game, but they failed to convert, and the Huskies capitalized. Washington (7-3) responded with an 8-0 run, all the points coming off Montana turnovers, and the Huskies were in control the rest of the way. “We got a little sloppy on a few of those possessions, which turned into turnovers. These guys are pretty good at that. They cause a lot of turnovers,” said coach Shannon Schweyen, whose team had 20 for the game. Montana had to play catchup from the very beginning. Making her first career start, Gabi Harrington put the Lady Griz up 2-0 just 16 seconds in, with a jumper from the left baseline, but Washington’s leading scorer, Amber Melgoza, knocked down back-to-back threes to make it 6-2. The Lady Griz would go more than eight and a half minutes without another basket after Harrington’s, but the Huskies didn’t take advantage. Taking nearly half their shots for the game from the arc, Washington would miss its next 17 3-point attempts after Melgoza’s early makes. Montana trailed 15-3 late in the first quarter but got baskets from McKenzie Johnston and Abby Anderson in the final 75 seconds to make it 15-7 at period’s end, maybe the most unexpected eight-point deficit the team’s faced this season considering the lengthy dry spell and six first-period turnovers. Washington could have pulled away in the second quarter but failed to connect on any of its 3-point attempts and went into the locker room 2 for 17 from the arc. That allowed Montana, even though it went 7 for 23 in the first half, to hang around. Harrington had six points in the second quarter, Katie Mayhue four, and the Lady Griz trailed just 27-20 at the half. “Gabi had some beautiful dribble jumpers and did a lot of nice things,” said Schweyen. Harrington led Montana with 13 points, one off her season high, two off her career best. Montana had nine turnovers in the first half, Washington grabbed 11 offensive rebounds. Both of those trends would continue into the second half and would ultimately decide the outcome. But not before Montana put a scare into the home team. The Lady Griz hit four of their first seven shots of the second half and pulled within five, 36-31, after a Harrington and-one in transition. With an opportunity to cut into the lead further, Montana couldn’t take advantage of an uncontested layup and Mayhue missed on a 3-point attempt one possession later that could have made it a two-point game. A turnover led to a Mai-Loni Henson 3-pointer (39-31), a turnover at midcourt led to an easy lay-in (41-31) and a third turnover in less than a minute led to a Washington and-one (44-31). Just like that it was a 13-point game. 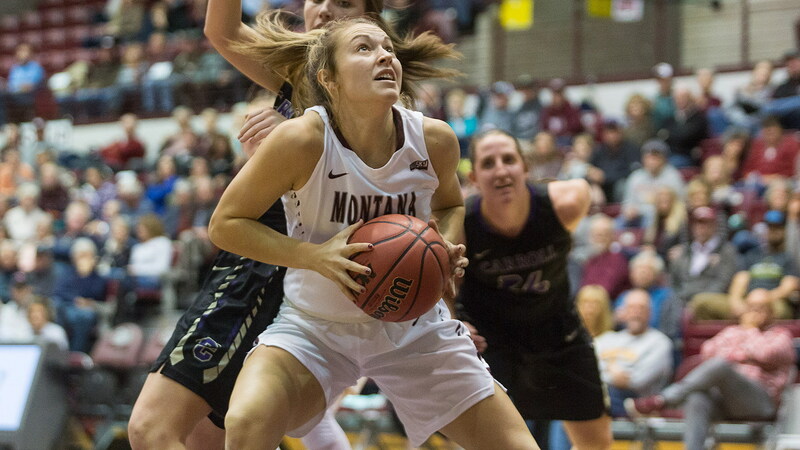 Montana trailed 49-38 entering the fourth quarter and brought the lead down to nine, 52-43, when Jace Hendersonscored inside with 8:10 to play, but Henson hit another three and that sparked a 17-3 run that closed the deal. “(Henson’s 3-pointers) were huge for them. They were struggling when she knocked those down, but they weren’t going to miss those forever,” said Schweyen. In each of its four losses, Montana has turned the ball over 20 or more times, and on Saturday, Washington did what Arizona did last week and hurt the Lady Griz on the offensive boards. The Huskies had 20 offensive rebounds by game’s end, partly a result of Montana playing zone, mostly Washington just being quicker to the loose ball. “They get you extended (on defense) and then you’re chasing shots from a long ways away,” Schweyen said. “I thought we got a little tired and didn’t react to go get some of those. We stood around and watched them go get them. Montana actually outshot Washington and held the Huskies well below their season shooting percentage, but turnovers and the Huskies’ second chances on offensive rebounds gave them 16 more shot attempts. Nine of the ten players who saw the court for Montana scored. “I was pleased with a lot of things today. This is a team that’s undefeated at home. We talked about making sure we’re improving with all the teams we’ve played. I thought there were a lot of good things today,” said Schweyen. Montana will face either Boise State or Saint Francis on Sunday at 2 p.m. (MT) in the Husky Classic consolation game.